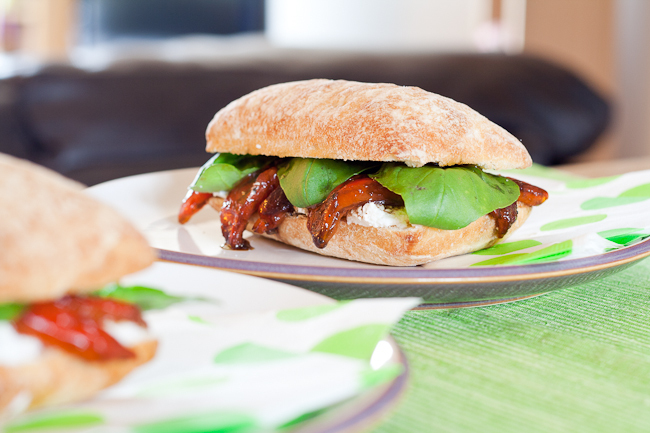 Goats Cheese & Roasted Pepper Ciabatta — What the Fruitcake?! My every day cooking is all about what I can make quickly but with the most flavour. I usually don't spend more than 20-30 minutes on preparing a meal during the week, and I'm not about to spend hours in the kitchen making lunch on a Saturday. And I just can't stand the thought of eating boring food. I don't eat with the soul purpose of refuelling myself, I want to enjoy the tastes, smells & textures while I'm refuelling myself. So when I saw this tasty little sandwich on The Barefoot Contessa, I literally went out to the shops as the credits were rolling to buy the ingredients I'd need. But of course, I did change it a little to suit myself. And what could be more tasty than the tang of goats cheese, balsamic & garlic marinated sweet roasted red pepper, the musky, peppery taste of fresh basil leaves on doughy ciabatta. The textures of creamy, crunchy and pillowy soft. The smell of sharp vinegar and the clove-like fragrance of basil. This probably takes me about 30-40 minutes to make (that's from start to finish. A good few hours less than the original recipe), but a lot of that is spent waiting for the oven to do stuff while I sit watching tv or whatnot. That's my idea of a good Saturday lunch! You can buy marinated roast red pepper but I can't always find it when I'm looking for it, and roasting your own is so easy there's just no excuse not to. If you have a gas stove, you can simply char the pepper directly over the flame. If you're all electric like me, all it takes is some time under the highest setting of the grill (broiler) with a few turns, and Bobs your aunty. You have a roasted red pepper. As for the marinating? Easy as dumping the peeled strips of still warm sweet red pepper flesh into a bowl of olive oil, crushed garlic, black pepper and balsamic vinegar. I don't even bother to let it marinade for a few hours the way Ina does. 10 minutes tops! I like to spoon some of the marinade onto the bread so I'm still getting all that good flavour in there. You can use any goats cheese you like. Herbed, garlic or plain, crumbly or not, anything you can get your hands on will do. The fresh basil is a must. The smokiness of this herb is just so perfect with the other ingredients you'll know if it was missing. I also like to buy the small ciabatta rolls that are half-baked and that you pop into the oven for about 8 minutes. It's like you got it hot out the oven at a bakery. Perfect! Adapted from Ina Garten's "The Barefoot Contessa"
Posted on July 25, 2011 by Mandy Mortimer and filed under Lunch, Quick Meal and tagged Basil Ciabatta Goats Cheese Lunch Quick Red Pepper Sandwich.